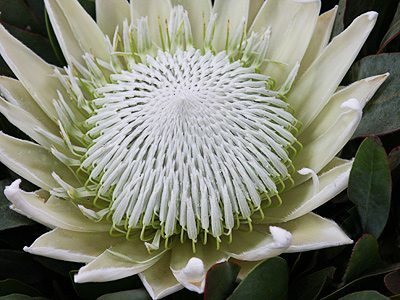 Widely grown for its outstanding flowers is the King Protea, the botanical name is Protea cynaroides and it is the national floral emblem of South Africa. It is grown widely in Australia and in fact all around the world, the huge flowers are the main attraction. Flowers can reach 25cm across and it is the intricate pattern created by the outer bracts and the inner stamens that combine to create one of natures gems. Grown as an ornamental plant in the garden as well as for its cut flowers which have long lasting characteristics and can be dried. Three main forms are available, the species which has a reddish flowers, the wonderful ‘King white'(see picture below) with brilliant white flowers as well as pink form. Although the flowers are large the King protea plant itself is not, reaching around 1m in height, although we have seen specimens around twice this size. Like all protea’s this species requires a warm sunny position with a well drained soil is essential. These are a spreading plant and will take well to pruning. It grows well in all soils as well as drainage is good. Suited to growing in containers, it will reach a height of around 1.5 metres, with a spread of over 1 metre, so a large container is required. Use a low phosphate fertiliser. For a plant with such wonderful flowers the King Protea requires little fertilizer, we like to use a liquid seaweed fertilizer twice a year, seems to work well for us. In containers us a slow release Australian Native plant food, or a specialist protea formula which will be low in phosphorus. 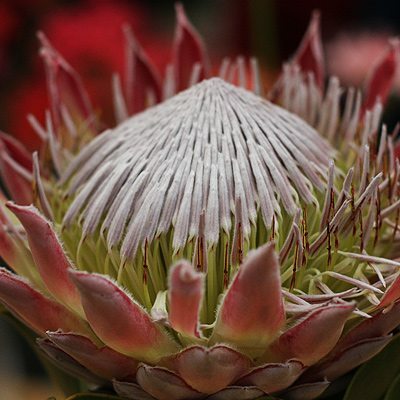 You can grow the King Protea in containers, it will need a free draining potting mix that is kept moist. Best results in pots will be obtained if you repot every two years as the potting soil becomes exhausted. It is possible to propagate the King Protea from seed as well as cuttings. Cuttings is the preferred method as this ensures that flower colour will be consistent with the parent plant. Cuttings are taken of the current season growth. Take a cutting around 10 cm long. Look for thiner stems as these seem to strike more readily. Strip the lower foliage away. Trim the upper foliage in half. Dip the lower section in a rooting hormone or in honey. The cutting is placed in a normal potting mix. You will need to provide some bottom heat, so a heated propagation tray can be used. Mist spray every second day or so depending on conditions. Once new growth is evident remove and keep the cutting in a protected position and pot up when more good growth is evident. Common Names – King Protea. Foliage – Large deep green. The Following Nurseries may have this plant in stock or be able to order it in for you.